Have you dreamt of conquering the highest peak of Spain for a while? Are you looking to finally have the unique and amazing experience that your friends who have already done it been telling you about? With the ascent to the peak by cable car you can realise your 3,718 m high dream. Thanks to the Teide cable car, after an approximate hour walk, you will enjoy like never before taking in the stunning views over the summits of Tenerife’s neighbouring islands – La Gomera, El Hierro, La Palma and Gran Canaria from the highest point in Spain (weather permitting). Dreams are only dreams up until the point when you suddenly make them come true. Make your dreams a reality and hike up to the highest point in Spain without worrying about applying for the permit to access the Teide crater because it is already included in the ascent to Teide by Cable Car, so that you can access Teide crater and enjoy the sensational views at 3,718 m high without worrying about a thing*! Feel the mix of sensations that only conquering the Teide summit can give hiking enthusiasts and nature lovers – adrenaline, personal accomplishment and physical and mental control. Hiking to the Teide summit with the cable car is perfect if you are short of time or energy to embark on this adventure from the starting point of the trail at Montaña Blanca. Use the Teide cable car to cover the 1,999 m ascent from the base to the upper station, situated at an altitude of 3,555 m, which marks the spot of the start of Teide National Park’s thrilling hiking route Nr. 10, the Telesforo Bravo trail. This trail will bring you to the impressive Teide crater for you all to enjoy one of the world’s most spectacular landscapes. Transport service with pick-up from the NORTH of the island is available from 6.45am to 7.50am. Transport service with pick-up from the SOUTH of the island is available from 6.30am to 7.45am. Pick-up time depends on the pick-ups scheduled for each day and it will be announced to the Customer by e-mail and text the day before the activity, which is why we kindly ask you to check your messages. For the same reason we need you to provide the name of your hotel or address of accommodation, as well as a mobile phone number at the time of booking. If you are making your own way here, the meeting point is at the Cable Car base station at 9.15am. Please meet your guide in front of the shop ‘La Casa de los Balcones’ (outside), which is located next to the cable car ticket office. Wear warm, comfortable clothing and proper footwear. Remember that since the Teide Cable Car facilities are located within a protected national park, you must follow a series of basic rules of civic behaviour and respect of the natural environment. For this reason please do not litter or take rocks, plants or animals and do not camp, make fire or loud noises. Children under 6, pregnant women and people with heart problems are not allowed to participate in this activity to hike up to the Teide summit with the Teide Cable Car due to the risk that high altitude poses to their health. The ascent to the Peak by Cable Car is not recommended for people with reduced mobility or injuries. If you have health problems, you should consult with your doctor before undertaking this hike. *Please be aware that we cannot confirm your reservation of the activity Ascent to Teide by Cable Car until we have issued the access pass to the crater in your name. If we are unable to confirm your reservation, we will offer you an alternative date or a refund of the amount paid. Moreover, due to the way the National Park’s permit issuing system works, if you book this activity, once confirmed by us, you won’t be able to cancel it under any circumstances. It is necessary to present your ID or passport at the point of access to the trail leading to the crater. In the event that the trail to the summit is closed or the cable car cannot operate on the day of the excursion due to reasons beyond our control, adverse weather conditions or cable car failure, an alternative excursion* shall be arranged and the amount corresponding to the price of the cable car ticket shall be reimbursed. Since this activity includes a permit to access the crater, we do not admit changes or cancellations once the reservation is confirmed. This is due to the way the National Park’s permit issuing system works. Check our Terms and conditions for information on other reasons for cancellation. Los Roques are the remnants of an ancient volcano. It is an alignment of ditches, pitons and piles of various volcanic materials. It constitutes the division between the two semicalderas into which the vast caldera of Las Cañadas is divided. This low-difficulty circular route with a maximum descent gradient of 215 m starts and ends at the viewpoint of La Ruleta, runs around Los Roques on its first stretch through the northeastern caldera, then descends into the southwestern one. During the two-and-a-half-hour activity, you will walk 3.5 km over volcanic landscape accompanied by your specialist guide every step of the way. Your expert guide will inform you, through your headphones, on every inch of this iconic, volcanic landscape, whose image used to appear on the now extinct 1,000 peseta notes, quenching your curiosity. Teide Cable Car facilities are perfectly equipped, including a shop, a café and a waiting room with Wi-Fi, among others, so that you can enjoy while you stay here. The Teide Cable Car base station is perfectly accessible by road and is located at 2,356 m above sea level. Its modern facilities are equipped with two cabins that travel to the top in under 8 minutes and can hold a maximum of 44 passengers, although for the comfort of our customers, we usually do not take more than 35 people on board. The views from the base station allow you to behold the spectacular peaks surrounding the Teide volcano. The base station offers visitors a relaxation area, café and buffet restaurant with impressive views over Teide National Park as well as a souvenir shop and public toilets. This is also the perfect place to find out about the different routes and trails you can do from the upper station. The Teide Cable Car upper station is the starting point of three spectacular trails at the summit of Mount Teide , which are directly accessible from a small hall from where you can walk outside. It has Wi-Fi, toilets and the highest public telephone in all of Spain. Although there is not a café in the upper station, you will have vending machines at your disposal with drinks and non-perishable food such as snacks. We recommend that you come prepared for all weather conditions since the upper station is at an altitude of 3,555 m.
The Teide Cable Car base station has a free car park with 220 parking spaces, where you can park your vehicle between 8am and 6pm. There is an information centre and a shop at the Teide Cable Car’s base station. At the base station you can find a relaxation area, café and buffet restaurant with impressive views over Teide National Park. Teide Cable Car is well connected by roads, and can be easily reached from any point of the island of Tenerife. Take the TF-24 motorway from La Laguna to Portillo de la Villa (La Esperanza Motorway), which connects with TF-21 that will take you to the base station of the cable car at km 43. 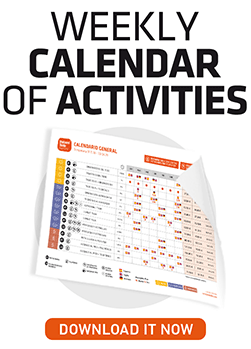 Check out our weekly calendar of activities and excursions on Mt Teide which we have prepared so that you can view at a glance all the information you need about our activities. Can I ascend to the peak of Teide by Cable Car with a pet? Does transportation on this excursion include return journey? Yes. We will pick you up and drop you off in the same location. Can I meet with the guide who will accompany me during the ascent to the Peak by Cable Car at the upper station? No. Since the activity starts at the base station, it is not possible. Do I need to print the booking confirmation of my ascent to the Peak by Cable Car activity? No, it’s not necessary. You can download the reservation and display it on the screen of any mobile device (phone, tablet, etc.). How much time will I spend at the Teide summit with this activity?